Today’s thought is don’t stop reading. If you study for your writing–research or similar genre–set those books aside. Let what you’ve read for study work its way into your writing naturally. But do read. Read for fun. Recall what it is that you love in a good book. Engage with a good story, a good laugh or a good classic. On Tuesdays, I compile the responses from last week’s Carrot Ranch Flash Fiction Challenge. So these 99-word stories about ruts are my mini-offereings to WriMos to take a break and read. For a feel-good break, I suggest Nano num-nums with fellow WriMo and Rough Writer, Geoff Le Pard. He’s published his first book which was a NaNoWriMo project, and is working on the sequel this month. How’s that for inspiration! What do you read when you are doing NaNoWriMo? Ed pays the bills. Edna cooks. They’ve never discussed it, but it’s been that way for 43 years. Edna wanted to hide the huge bill from Watkin’s Department Store. She intercepted the mail, plucked the bill, and went online to pay it. Edna managed to transmit $2,414.00 electronically to cover the $241.40 bill. Ed decided to broil himself a chicken. He set the oven to 500 degrees, plopped it in, closed the oven door, and left. The smoke alarm woke him up. They quickly returned to their rut — or groove. Ed pays the bills. Edna cooks. “Nobody mentioned moving to Spain,” said George. “Why not? The heat would do wonders for your arthritis,” said Irene. You can read her other two character flashes at Annectdotal. Anne Goodwin is working on her Not Quite NaNo project. He saw it then: the repossession letter on the kitchen table. Bill’s upper lip curled as he grabbed the letter and his lighter. Outside in his back garden, sparks flew up into the dawn-lit sky as he watched the letter burn. Now he breathed. Each night she promises herself not to go back to that kind of life, but morning strikes, and the gratitude of being rescued when she was in the dungeon always springs up when she wants to revolt thus faithfully follows the 9am to 9pm orders without any debate. She drags herself to the routine while relying on her destiny. Knocks twice on her door, prior to entering, and finds her body pale with no expressions. Moans when her master is declared dead, and guilty when she hears about acquiring 25% of her wealth. Oliver knew precisely when it started. The nurse had asked him to fill out a form. That was eighteen days ago. Oliver had forgotten to write his street number on the “address” line. Now there was a sheet with Oliver’s name on it, written in blue ink, tucked in a file cabinet somewhere in that building. And on that paper was a blank spot where there should be blue numbers in Oliver’s handwriting. He had walked to the office twelve times with his blue pen. They wouldn’t let him behind the check-in window to write “1397” in the space. And still the flow of wagons continued. By day, Sarah took coins from teamsters for crossing Cob’s toll bridge and at night she tallied the income. Cob was amassing a fortune in dimes and silver half-dollars. He’d stop by when he wasn’t building. Last week it was a hay barn for the stage coach company that agreed to make Rock Creek their stop, and this week is was a cabin for the schoolteacher he hired. It all pounded against Sarah–the busy days, the lonely nights. She felt as cornered as the iron-clad wheels that rolled down rutted tracks. Joseph’s thoughts flurried with worry until a voice quieted them. Joseph searched for the voice. He questioned the sky, sea, fauna and flora. Speech came from inside a flower. Mind liberated, unlearning complete, eager to explore the world, Joseph’s new life brought joy to everyone he met. A deer run approaches the hiking trail. The sign reads “Do Not Stray Off the Path.” Always the rule-follower, Hannah turns onto the natural highway. The ground is soft, grass bends beneath her feet. She has entered a dim world that smells of earth and evergreen trees. Mushrooms and wildflowers speak peace as dense trees mute hikers’ conversations. Her body settles against a rotting log that gives to her weight. Her lungs expand as she breathes in the forest. The long chore list forgotten, she takes in the pleasure of nature that is carefully cultivated out of modern life. Mills stared at the cinderblock wall. He knew each crack and crevice, hell, he’d even counted the pores until the shadows dragged him to sleep. A shake of the head, then back to his notebook. His account needed to be told. His pen scratched the surface, then stopped. A wail of agony. Mills rose, his old joints aching and popping. That’s the thing about concrete, it just took, never gave. He never got used to it, the walls or the wails. And still four hundred and thirty one more days until it was over. If there was anything left. The rutted path made Mary stumble; she didn’t mind. Cursing the dog was like cursing her father; good for her lungs and it let her think. She had seen Rupert. He said Peter was her real father which meant he had an affair before the one with Angela, Rupert’s mother. Oddly it didn’t shock Mary; any more than that the woman she called ‘mother’ had accepted Mary as her own. Mary imagined her mother’s reaction: calm, practical, no emotion; nothing to upset her ordered existence. Mary was different. She kicked the tyre tracks. She would find her real mother. Pamela walked to the clothes line. The rut in the path caused the bag hanging off her waist to bang her hip with each lopsided step. Goodbye Sarah Shull of my flash fiction. You have led me to your story and no longer will I toy with who you are in 99 words. Never did I suspect that the biggest project I would take on as a writer would evolve from 99-word explorations. 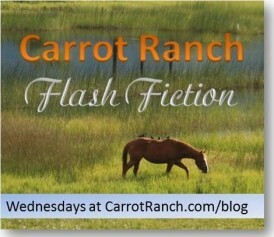 Tomorrow I’ll post the next Carrot Ranch Flash Fiction Challenge and explain how consistent craft practice led to a break-thru moment as a writer. The scrape of brake on iron-clad wheels and shouts of “Whoa!” signaled the arrival of yet the third wagon train. Dust clogged the air outside the toll cabin with a throat-choking fog. Sarah kept the curtain snugly pinned to reduce the permeating dust that still seeped into the dark room. It was cool inside despite the heat of day. Before stepping outside, she smoothed back her dark hair, checked the hairpins in her bun and put on a sun bonnet of deep blue calico with emerald green hexagons outlined in white. First she would need to dampen a small patch of hankie, the material neatly matched her bonnet, so as to have it to breathe through if the dust was too thick or to wipe her face to keep it clean. Another shout of “Ho,” came from outside. Sarah shook her hips as she stood to settle her skirt and petticoats. She took a sip of water from the tin cup next to the water bucket and felt ready to go dicker with the wagon master. Before opening the door, someone from outside pounded heavily. She frowned at the ungentlemanly haste of the knocking. While she didn’t share Cob’s view entirely regarding the Yankees, they were an impatient lot. The man wore a duster and had a kerchief of red tied around his neck. It must have served as a mask because his mustache and chin seemed cleaner than the white dirt that paled around his eyes and coated his cheeks like pastry flour. A large round hat shadowed his dusty face but didn’t hide the surprise at seeing Sarah. By now she was used to the looks wagon masters gave her. If any looked too hard or too long they often met a second surprise—Cob’s fists. “About that. Since when has Rock Creek crossing required a toll?” She could see that he was angry, but kept his words soft. He didn’t sound Yankee or Carolinian. So many people had passed through here since she and Cob took over the way station by the first of April, that she was still hearing the variances of place upon speaking. “What kind of cod-head would go and do that?” He snapped his hat against his thigh, dust rising from it and spooking his horse. By Charli Mills in Flash Fiction Challenge, NaNoWriMo WIP 2014 on November 5, 2014 . Thanks for your cheers! I really like the NaNo design this year. I wasn’t the target market for last year’s retro gamer look! Thank you for taking this journey with me. This is what I love most about drafting–the way the scenes and characters come alive right before me. And, of course, another terrific compilation of stories. I still laugh over your reminder of rut’s other meaning! I’m loving the journey and won’t continually ask “are we there yet.” but rather patiently, happily go along for the ride. Ha, ha! My beta readers from novel 1 gave up on seeing it in print. I hope to get better/quicker at revision. Thanks! Ah… but you are passionate about this one. The spark ignited in this one for certain! So you give me a shout out! What a true friend. A proper chum. Thank most kindly ma’am. You excerpts continue to whet the appetite. No need for moist hankies! What your pieces do is tantalise us with the geometry of these relationships. We want to think they are offered in some sort of chronological line but they also feel like they could be peering both back and forward. Tease! You are peeking into my mind (scary) and seeing that it doesn’t work chronologically, but in the end, I hope the balance rings true! Enjoying the Num-Nums as a WriMo and have elevated Harry Spittle to near-Potter proportions–actually I find Spittle more interesting and would love to read his schoolboy years! Now there is a thought. My inspiration in some ways is Adrian Mole so could that be another book in the pipeline? Thank you, Sherri! I’m glad you felt as sentimental as I did saying goodbye to Flash Sarah. Glad to have you all on the dusty trail with me!